Myths often originate from words-of-mouth and get handed down from generations to generations. Most of the times, myths are unreal. Reality, on the other hand, always measures observation objectively. This article mainly concentrates on defining remittance and its impact on Nepali economy through myths vs reality lens. We are taught that remittance can harness prosperity, contributes to family happiness and leads to long-term investments. Remittance is embedded in our psyche in such way that we think it alleviates poverty and ultimately brings prosperity to the country. Much of the labour migration, before restoration of democracy in 1990, was concentrated to India. Suddenly new destinations emerged with the intensification of globalizing dynamics and the boom in the oil industry that started in the Middle East in the 1970s. The economic liberalization coupled with the establishment of democracy in 1990 transformed the country’s economy into a liberal market economy that resulted in out-migration for labor. 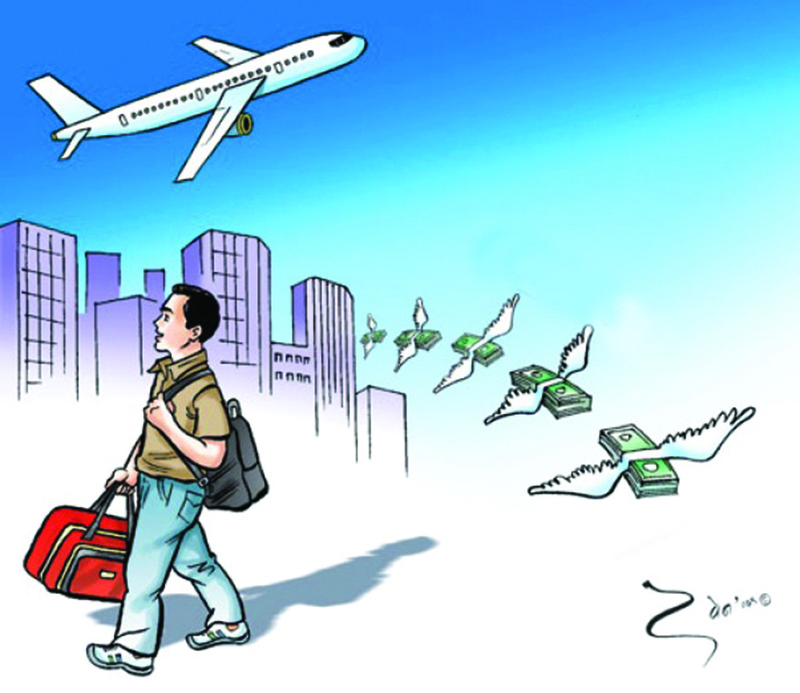 Since then labor migration to other countries has become one of the ways of earning money for Nepalis. According to the report of Department of Foreign Employment (DoFE), Malaysia is the most attractive destination for Nepalis (40.9 percent) followed by Saudi Arabia (22.9 percent), Qatar (20.3 percent), United Arab Emirates (11.2 percent) and Kuwait (2.1 percent) between 2008 and 2015. Nepal witnessed a large number of out-migration from the 1990s. The record of 3,605 out-migrants in 1993 increased to 106,660 in 2003 and the number cumulated to 527,814 by 2014. According to the Economic Survey, with the gradual increase of out-migrants in ten years (2003 to 2017), the remittance increased to NRs 699 billion from NRs 58.6 billion. The remittance-receiving households in 2011 reached 56 percent while it was 32 percent in 2004. According to the Household Survey of Central Bureau of Statistics, 80 percent of remittance received by households is spent on consumption, followed by 7.1 percent on repaying loans, 4.5 percent on purchasing household property, 3.5 percent on education, 2.4 percent on capital formation, 0.5 percent on business and 0.6 percent on savings. Yes, remittance has helped improve socio-economic status of the families in Nepal and has worked as ‘anti-poverty force.’ But it has not done much for our development. If we compare the GDP (Gross Domestic Product) growth rate against remittance share in the three-consecutive financial years, we can find that the share of the remittance to GPD has outnumbered GDP growth rate. GDP growth rate was 5.72 percent, 2.32 percent and 0.77 percent in 2013/14, 2014/15 and 2015/16 respectively. On the other hand, the share of remittance was 27.66 percent in 2013/14, 29.11 percent in 2014/15 and 32.09 percent in 2015/16. 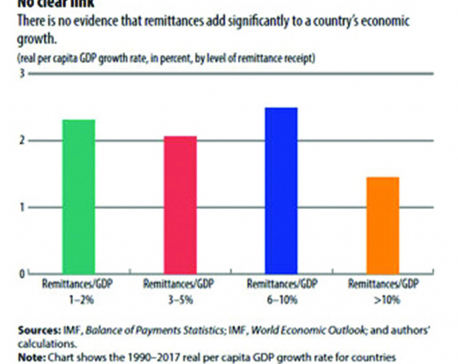 It can be argued that remittances do not necessarily lead to long-term investments since migrants and their families usually spend them on consumptive investments and rarely invest in long-term investments. The consumptive behaviour, in the long run, creates a consumptive economy which will pose multiple risks to the country’s economy. According to Department of Customs’ annual trade statistics of the fiscal year 2017/18, the country imported goods worth NRs 1,243.29 billion against exports worth NRs 81.19 billion, resulting in trade deficit of NRs 1,162.10 billion. According to World Economic Forum (WEF), there is no single remittance success story despite the fact that many developing countries receive a large amount of remittance. We have not been able to prove WEF claim wrong. In Nepal, remittance and labor migration have fair share of its tolls—family breakdown, divorce and death of migrants in destination country to name a few. Besides, Nepal is losing potential human resources required for local development as labor migrants mostly belong to the age group of 20-44. This will cause serious developmental challenges in the long run. Remittance has also nurtured the culture of policy laxity among the policymakers, as they feel less concerned to address the policy weaknesses, leading to poor investment climate and low investment. This phenomenon fuels low job creation and again encourages out-migration by creating a vicious cycle. This is what is happening in Nepal now. Scarcity of skilled human resources is going to affect the labor market. The bad thing about remittance is that it creates a culture of dependency among of migrants’ family members. Evidence shows that remittance-receiving families indulge in more lavish lifestyle and do not take up income generating activities. That said, it is also true that remittance can facilitate economic growth if we stabilize consumption and create favourable conditions for economic growth. For that, we need to able to encourage the migrant returnees to use their skills and ideas at home. We need to formulate effective policies and programs to encourage remittance-receiving households to invest the money in productive sectors. If we can create an entrepreneurial culture in Nepal for the age group between 20 and 44 migrant workers, they will be motivated to come back, invest and work in Nepal.